Blog - Is break-and-enter a real threat in Australia? Is break-and-enter a real threat in Australia? We Australians refer to our home as the lucky country. As a first world nation we’re well ahead of much of the rest of the world when it comes to things that can affect the likelihood of break-and-enters, including law enforcement, social welfare and access to security products and services. Australia is generally regarded as one of the safest places in the world to live. So do we really need things like CCTV cameras – especially in areas like Sydney? One look at Australian burglary statistics will answer that question emphatically. Yes. The latest numbers tell a sobering story. Property crime was one of the only crime categories which has experienced a slight upsurge in recent years, with unlawful entry and theft both on the rise. Almost every state experienced a rise in these crime categories according to the latest numbers (2015), with people seemingly more and more willing to break-and-enter both business and residential premises. 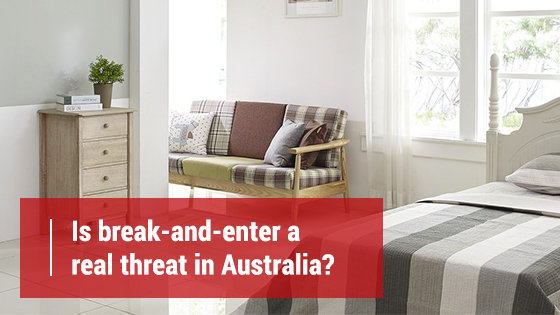 Around 180,000 Australian households experience a break-and-enter every year. What’s more, those premises that are targeted once are often targeted again. In 2010, for example, 20% of the households that were burgled were actually burgled multiple times. So sure, Australia is the lucky country. But it’s fair to say that you don’t want to push that luck too far. The installation of a CCTV system, be it at your home or your business, can guard against the sort of crime that is almost impossible to completely wipe out. No country is a Utopia, and as long as there are things to be stolen or grievances to air, there’ll always be a criminal element in any society. Mitigating this threat with a professionally installed security system offers property owners peace of mind. A CCTV camera system serves multiple purposes; it can be professionally monitored to identify a crime being committed and allows them to instantly act on it, it records criminal behaviour enabling you to bring offenders to justice, and it also serves as a deterrent to would be criminals, preventing crime before it happens. Is break-and-enter a real threat in Australia? Yes. Can you mitigate this threat? Most certainly. To find out more about security systems including CCTV cameras, call the friendly team at Red Handed Security on 1300 13 40 33. What security device is best for your business? What does 24-hour back-to-base monitoring entail?